You must be wondering that why I am greeting you by such a name! Actually, this article is been prepared only for those who are beginners in investment activities. So, if you are the same beginner then, answer the following first? Do you want to make investment decisions, but you have the phobia of getting a loss? Do you want to invest in your property, but you have a lack of investment knowledge? If your answer to the above both questions is ‘YES’, then Mutual Fund is surely been made for people like you. Now you must be thinking that what is this Mutual Fund? A Mutual fund is actually an investment tool which helps you in removing your headache for knowing about the different investment schemes/stocks stuffs in the share market and then making an investment decision. You must have experienced some time that whenever you think to make an investment, the first thing which may bother you is that at which channel you should invest. After that, you try to figure out whether the invested channel will benefit you? And if there is any guarantee to get any return on your investment? The Mutual fund is just a simple solution to all such doubts. The Mutual fund is like your buddy who collects the money from you and takes all headaches with it. It makes investments on your behalf in different policies which are going in the stock market. The investments are provided a guarantee that it will be made under the knowledge of professional and experts who are well-versed in the market financial up-downs. You just have to hand over your investing money to the trustees of the association and then no need to take any a headache about and investing decisions. You’ll simply get the profit time to time for the investment made by you. What is IPO & its process? This is the main thing which you should understand. A Mutual fund with the mutual understanding of the user collect funds and then the professionals/ experts who are well-knowledgeable in financial management takes the guarantee to take care of your deposited fund. The field professionals examine the various policy schemes or stocks which are prevailing in the market and evaluate them one by one from every angle that how does the investment in these respective mutual fund schemes will benefit them or if they provide them benefit or not? As they better understand the share market conditions and the financial economy of the country, therefore they have enough knowledge about which policy will be best for the user to get the benefit. So, on the basis of this understanding and on the basis of their analysis of the market policies, they make some investment decisions. The funds collected from the user are then invested in the best-evaluated policy scheme ex. stocks and bonds etc. The benefit generated out of the policy investment is added to the beneficiary’s (users) account. As the benefits depend upon the market fluctuations, therefore the profits in the user’s account may also fluctuate. Either you can withdraw your benefitted amount from your account in the form of a dividend, or you can re-invest the benefited amount to get additional benefits or growth. See how? Mutual Funds for Retirement Income? When you decide to withdraw your money, you can see your return on investments in your account and stop your further investment processing, you can simply withdraw all your funds from the account by consulting your broker. You can also sell these funds to the Mutual Fund at the Current NAV (Net Asset Value) and get your money with an additional amount. 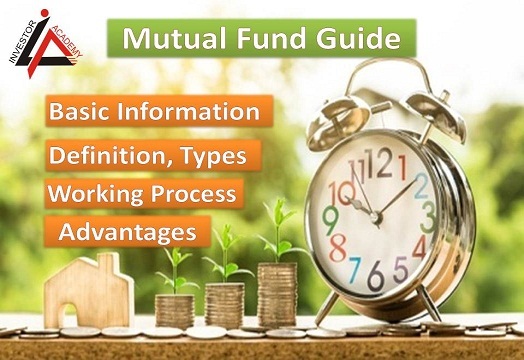 This facility is under mutual fund dividend option If you wish to get more and more benefits from the mutual fund, then you can continue your membership with the mutual fund. The money earned by you on your initial investment can be re-invested. This happened under mutual fund growth option. Suppose you had invested Rs1000 and you have been benefitted for RS 100 means now your amount becomes Rs1100. These 1100 can be asked by you by the company to purchase it at some NAV so that the amount can be re-invested in the market. Are you getting? This is like a business. Ok! Suppose you have purchased these 1100 funds for Rs 10, then you have to pay 11000 Rs, to the company as your investment unit. Whenever your amount will be invested by the Mutual experts in some company stocks, you will get more amounts of returns. After a year, if the stocks invested rise and net asset value (NAV) climbs to Rs 12, then you can now sell the units back to the mutual fund at Rs 12 and you would get Rs 132,000 for your 11000 units. Hope now you better understand how mutual funds work in the share market. Here we discuss what are different types of mutual funds in India? How to Invest Money in Share Market for Beginners? The decision regarding the selection of the Fund for investment totally depends upon the user’s choice. If you are a user (investor) and you want your expert to invest in equity funds only then, he has no right/ dare to invest in some other fund. The advantages associated with an Equity fund investment are more entertaining than any other kind of Funds. The individual who invests in best top rated equity mutual funds shares get the higher rate of returns and the rate is dependent on the success of the company. Although there is a high risk also associated as if the company does not make any profits or it goes down, then the individual will either get low returns or his/her invested capital can become a sink. Here under this category, you’ll get many options to choose such as Large-cap funds, Mid & Small-cap, Diversified equity funds, Tax Saving Funds, Index funds etc. This is secured in nature as it provides returns like what you get through your Fixed Deposits. The investment in Debt Funds provides the surety to the investor that he/she will definitely get a fixed amount of return as these are invested in securities like corporate bonds, treasury bills, government securities, money Market instruments etc. This kind of fund is a mix of equity fund and the debt fund. This is a very moderate selection by the investor. This is because half of his fund is invested in the equity fund and the other half part is invested in the debt fund because both the funds have their own advantages. To get the mix benefits of both, the user chose to invest in balanced funds so that the higher rate of returns can be enjoyed on Equity in times of company’s prosperity while the fixed rate of returns can be enjoyed on debt funds, even in case of losses. It means either of them can compensate the other in times of losses. This is exactly like your Debt Funds. It is also known as Liquidity Funds. The return on investment policy is the same as what you enjoy through Debt securities. The difference is only that, in debt fund, you have to wait long 3-4 years to withdraw your earned money, while in the Money Market Fund; you can lock your investment for minimum 15 days. For your kind information, the Money Market funds mean investment in commercial papers, commercial bills, and treasury bills certificate of deposits and other instruments specified by the RBI (Reserve Bank of India). The individuals who completely are not ready to take any risk with their capital, they find Gilt Funds as the best option for investment. The Gilt funds provide government securities for individuals to do investment in where the individual not only get a fixed rate of return but also get high security to his/her invested amount. Although he gets a lower return compared to the debt fund, at least your amount is secured with the government institutions. What are the benefits and risks of the mutual fund? To invest in marketable securities, you are not all be needed to acquire knowledge of the market economy, financial statements or financial market, not even any experience you need. You are completely kept out from the headache of making decisions regarding the best investment picks to invest. The professions take complete care of your money. Mutual Funds are easy to buy because these are available to you via Banks, corporates, mutual fund companies, insurance companies. You surely have accounts in any of these institutions, so you can easily open an account for a mutual fund with the institution. You can invest your money in various diversified plans and get optimum benefits out of that. It is not necessary to invest a big amount of money in Mutual Funds. Rather, you can afford as low money as Rs 500 for your beginning session. There is no need to monitor your invested money. This is the job of Mutual Fund experts who will not only regulate your investments but also let aware you about the profits you have gained from time to time. If you want to exit out from your investment, you can easily do so without doing any complicated kinds of stuff. You just need to tell your broker or financial advisor and he will sell your funds and transfer your money to your bank account. As the invested money in mutual funds are supervised and managed by the high professional, so they need to pay a brokerage for their service. Before you get your Rate of returns, you have to pay them first their service charges. If you have chosen any mutual fund plan which locks you for 5-7 years to gain the profit/ your earned money, then you become bounded with that and even if you want to, you cannot get out from that plan before 5-7 years completion. You have to pay operating charges also to run your fund. Means if you have invested Rs 1000, then to operate this fund in the market, the professionals charge some percent for its operation; say 1- 2%, which means every month you are paying 200 Rs in charge of operating your business. In case of dissolution or losses, your money may get dissolved or you may get low returns respectively. There is no guarantee of returns on your investment because mutual funds investments are subject to market risks. Hope now you better understand the mutual fund basics. If you have any question regarding this you can ask me in our comment section given below. Now if you accepted all of these terms and wanted to invest in mutual funds then check given points below. Complete guidance on How to start investing in mutual funds? You can use SIP method also. In lump sum method, you can invest any amount in any market situation. When the market is down you can invest a large amount to get more units of your mutual fund plan. You can invest any amount in mutual funds, it is called a lump sum investment. Unlike lump sum investment, SIP relieves you from giving most of your pocket all together in investment and that too at one go. Rather, it enables its investors to extract just a small amount of money like Rs 5000 or Rs 1000 from your overall income every time (monthly, or quarterly). This small amount of investment never feels you like you are left with no more money; in fact, it will not affect your pocket also. One more thing is that SIP allows you to redeem the amount on the first-in-first-out basis. Why are mutual funds better than stocks? Stock market means it is excluding guidance from experts and the trading activities will be done personally by yourself on your understanding. The transactions here are executed only at your orders, although the results will obviously depend upon the market phenomenon. In the stock market, you solely are responsible to order the transaction in the trade and get the results, whatever it would be. And you can solely trade in stocks only when you have well-knowledge regarding the market. So you have to possess yourself with good knowledge about the SENSEX or NIFTY and other stock trade markets. You should be well-versed by the different funds and their associated profile with their performance. You should know how to invest and how to manage your funds on your own at your own risk. Mutual funds are far better than the stock market when you have zero or doubtful knowledge about investment. The reason is that it provides high-class and well-knowledgeable experts to guide you through every step. They take the responsibility of your funds and direct your fund at the most suitable securities for investment. Note:- After spending some time if you understand the basics of mutual fund investment you can also switch to direct plan. It also saves some long-term benefits. Check Difference between Direct and Regular plan in mutual fund schemes. Is mutual funds good investment in India? Yes, there is no doubt in the fact that the mutual funds are the best option to invest in India because India is a developing nation where economy tends to grow day by day. The industries and business firms here have well opportunities to grow and expand their sectors, which in turn benefits the investors as they get high returns and attractive investment offers from these expanding businesses. The government of India has already issued some agreements in lieu of the business sectors and still it is carrying out various schemes, which are benefitting the business sectors to grow rapidly and possess the high growth potential in future. So, there is high scope to grow in India. This is just a very basic understanding of the Mutual Funds, which I have tried to explore in a very easy language. I hope that you have understood the concept well. The topic doesn’t end here; there are many associated subtopics, which I will pick one by one in my upcoming article. So, stay tuned and wait for another new article. Thanks. Next articleNCD (Non Convertible Debentures): Types, Benefits, Taxation, How to Invest?